What is your favorite ice cream flavor? Vanilla, Strawberry, or Chocolate? Frankly, to me they all taste quite the same if we are talking about ordinary ice cream in supermarket. 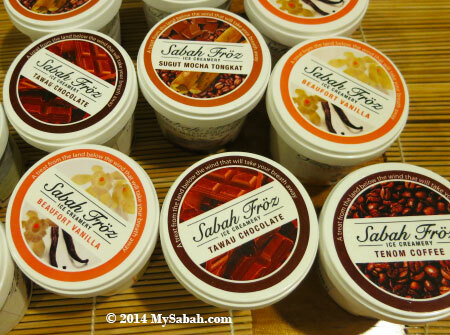 Now we have ice cream that “tastes like Sabah,” a great news to those dessert lovers who are bored with common flavors. 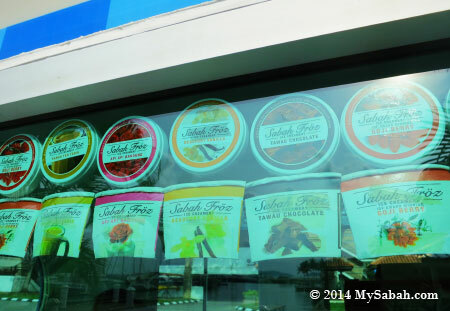 The flavors are named on their location and ingredients sourced from there. 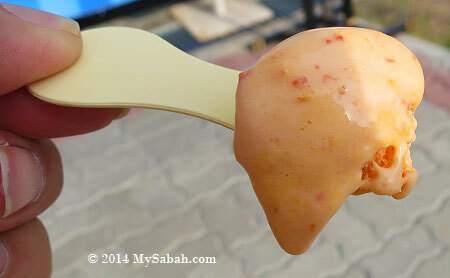 The mango are from the farm of Sabah Chief Minister, so it is only available during fruiting season. At first I thought the unique name is only a marketing gimmick. After trying the ice cream, I agree that each flavor has distinct taste. But the most important of all, it’s the milk that makes the big difference. 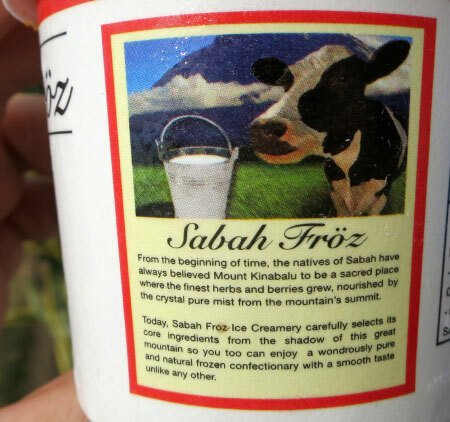 Instead of using milk produced by cows reared in barns, they use fresh milk from free-grazing Hotein Friesien cows from Desa Dairy Farm in foothill of Mt. Kinabalu. Free range cows are happier hence better milk quality. Holy cow, sort of. Currently, you only can buy this ice cream at the first kiosk at jetty of Sutera Harbor behind Pacific Sutera Hotel of Kota Kinabalu city. 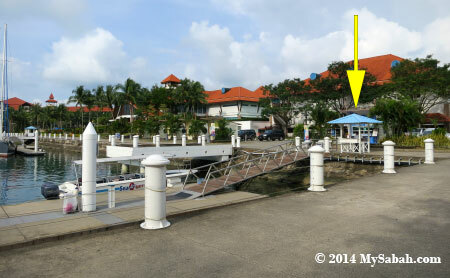 You may Click here for the Location Map. 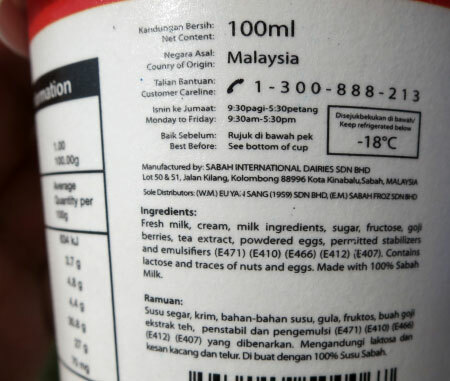 They are working with Eu Yan Sang Malaysia, so you would find this ice cream sold in 89 outlets of Eu Yan Sang nationwide by year end (includes Peninsula Malaysia). They are also looking for retailers. 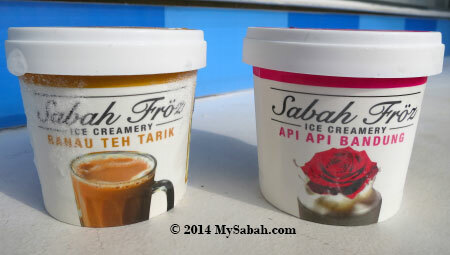 You may follow the Facebook of Sabah-Froz for update. They will have second outlet in Oceanus Waterfront Mall (Kota Kinabalu) in Jun 2015. 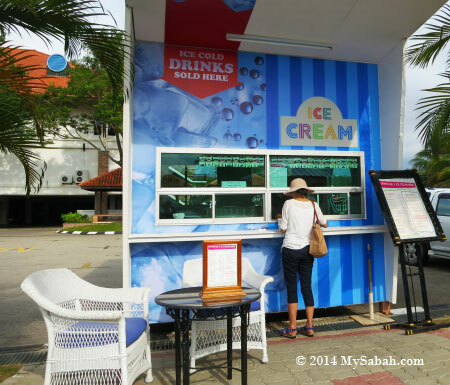 Pic: This ice cream kiosk opens from 7:30am to 7:30pm daily. 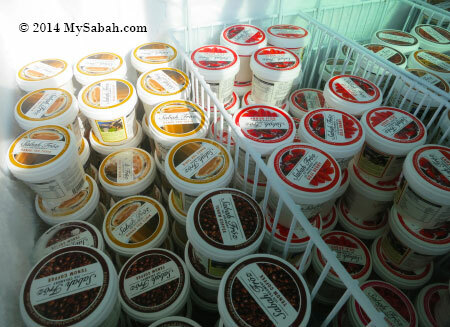 If you want to have something special in your private events such as birthday party, you may contact their Customer Careline (Phone: 1-300-888-213) or Ezani (Phone: +60 14-5692917) to order the ice cream (minimum 50 units). 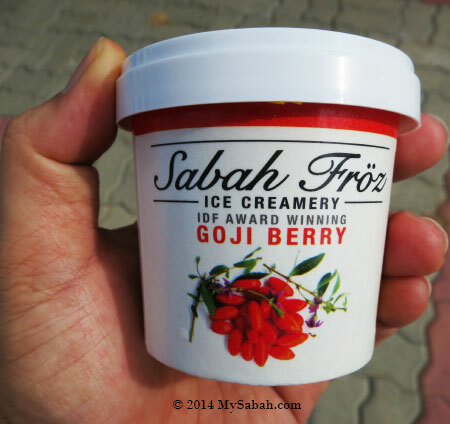 Goji Berry and Sugut Mocha Tongkat flavors cost RM8 (≈US$2.40) per cup (size: 100ml), and other flavors are RM6 (≈US$1.70) each..
Sabah Froz Ice Creamery has invested more than RM1 million on setting up the production line and freezer in Kota Kinabalu. Since there are many flavors, you may not know where to start. 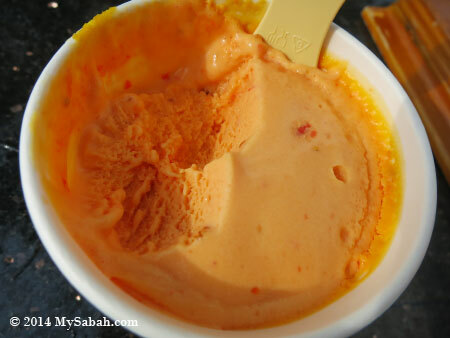 I strongly recommend Goji Berry flavor, which is the winner of the Best New Ice Cream award in the International Dairy Federation Dairy Innovation Award 2011 in Italy. Goji Berry is a popular herb in Chinese diet because it has anti-ageing and eye-nourishing properties, something that we really need, due to constant exposure to excessive blue light and free radicals from computer. From the photos, you can tell this ice cream is dense. The taste is really smooth and deep. It’s not too sweet. The mild sour of Goji Berry blends perfectly with the sweetness of the milk, making me want to eat more. It passes my quality test and I think it can rival the premium brands. I don’t mind eating it every day (I would become a fat dude with sparkling eyes lol). 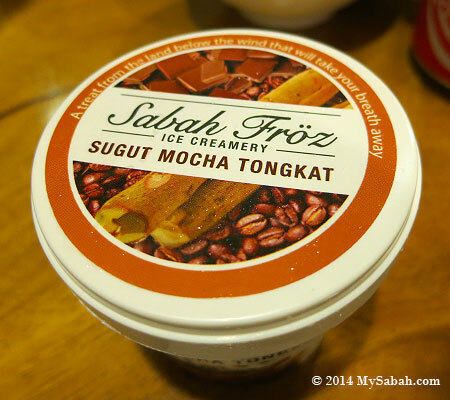 Another flavor that I have tried is Sugut Mocha Tongkat. 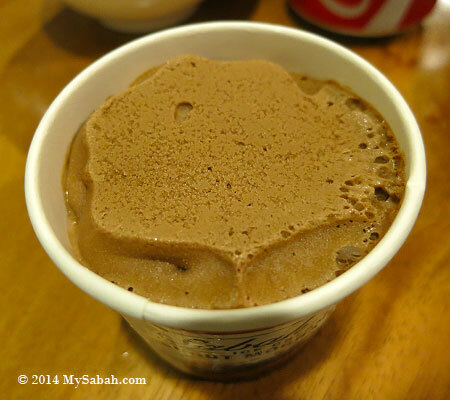 Sugut Mocha Tongkat is sweet and bitter, some may not like it. If you love dark chocolate like me, you will enjoy it. 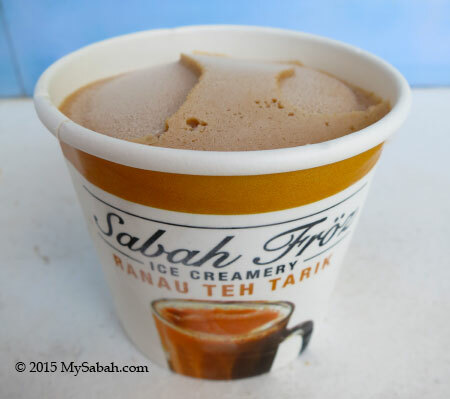 Ranau Teh Tarik ice cream has strong milk flavor, not bad, but I hope the tea flavor is stronger. 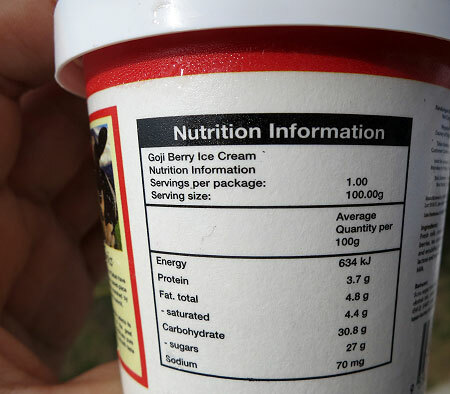 Pic: Nutrition information of the ice cream for those who are Calorie conscious. Each serving is about 634 kJ (151 Calorie). Have you tried all the flavors? Please tell me which one you like the most ok.